Kojey Radical is the voice the world needs right now. No matter what you call him; MC, poet, creative or anything else, his unique approach to rap music has made him one of the hottest prospects in the UK. Just three EPs into his career, he's already opened for the likes Ghostface Killah, been nominated for a MOBO and pioneered a truly individual sound. 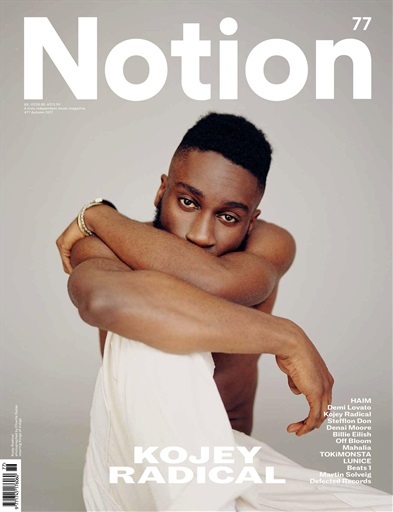 Tackling topics as vast and complicated as structural racism, class inequality and life as a young black man in modern Britain, Kojey makes some of the most striking music in Britain today and works alongside some of the most pioneering creative talents as he does. Where other rappers deliver tunes, Kojey Radical comes through with an entire world; a landscape of insightful lyrics, charged delivery and boundary-pushing visuals. For Notion 77, we explore transcendence and what happens when musicians move from one world to another. As he begins his journey from underground hero to voice of a generation, we speak to Kojey Radical about maintaining his independence, learning from the legacy of British rap and making political tunes you can turn up to.